Marketing professionals must adapt their digital strategies to the evolution of the complex digital advertising environment. Enhanced insight into a more serious and in-depth level of digital advertising is a must-have, part of the ongoing effort to attract prospects and maintain a loyal customer base. Making use of dynamic advertising solutions fused with automated personalization capabilities increases the richness and personal level of engagement and thus leads to higher marketing ROI. Traditional campaign approaches make the assumption that all potential customers are alike and one ad fits all. Audience segmentation is an opportunity to know the buying psychology of the customer and capitalize on the touch points that trigger a reaction. This type of ‘psychographic’ approach separates consumers into various elements of interest and pulls each one in, depending upon their position in the conversion cycle. Audience segmentation transcends the old linear conversion funnel of ‘looking – interested – purchase’ to deeper, non-linear journeys that illustrate the complex behavioral factors that need to be taken into consideration for behavioral retargeting. The conversion optimization process lets you implement structures which deliver the right messages to each audience based on their distinct and unique needs and expectations. Segment groups for retargeting can include those who opened your emails as well as the ones who read them multiple times, individuals who viewed a complete video or those who began an e-commerce order process but abandoned their cart. Crafting a specific follow up message that is customized for each behavior offers the chance to convince your prospect to complete a purchase. An additional advantage is in sifting out those prospects who may be considered irrelevant, such as existing clients (if applicable) or those who spend less than twenty seconds on your website. Make use of any and all tools such as web analytics, CRM information, email and campaign reads and click-throughs to establish a baseline hypothesis group and continue to drill down to establish more concrete customer segments. Making use of rich offline data from your CRM system and adapting it to targeted online campaigns is the heart of CRM data onboarding. This approach bridges the strategies to re-engage, cross-sell and even upsell to an existing interested audience. An example might be to use retargeted cookies with an online ad, match it within the CRM, and then craft a specific campaign for that viewer. Depending on the business and technology, this can be considered a type of data mining to attract those most likely to buy. Email campaigns can help upsell the latest product or release to existing customers. Loyalty programs use purchase history statistics for cross-sell opportunities. Online statistics unlock the cohesion between existing data and interest level. Each level gives you the opportunity to extend your reach, capture attention and make smarter use of your data and marketing platforms. Omnichannel targeting relates to the ability to attract and maintain consumers’ attention on the many devices they use. In essence, it is done by monitoring ever-changing consumer behavior and capitalizing on it. The goal is to engage customers with highly relevant and targeted messages on desktop, mobile apps, mobile web and tablets. However, this may be easier said than done. There are many technological barriers involved in cross-device and cross-channel targeting. Tracking behavioral patterns across devices can be tricky, at best. Making use of intelligent targeting and ad-tech solutions can assist in maintaining the information that has led to both interest and potential purchases. 70% of retail industry senior executives have already adopted omnichannel strategies as a method to link consumer behavior with company websites, mobile devices and social media platforms to create a seamless customer shopping experience. Have you? Personalized ads make use of a user’s cookies when they have visited a website to retarget these users with highly relevant promotions for products or offers that they may have displayed an interest in. Whether the consumer is price shopping or comparing value, the retargeted ads address an interest they have already expressed on a personal level. The ads are a reminder of the need, which is a psychological touch point that can lead them through a faster conversion journey. Generally speaking, display advertising could typically see 0.05% CTR and above. 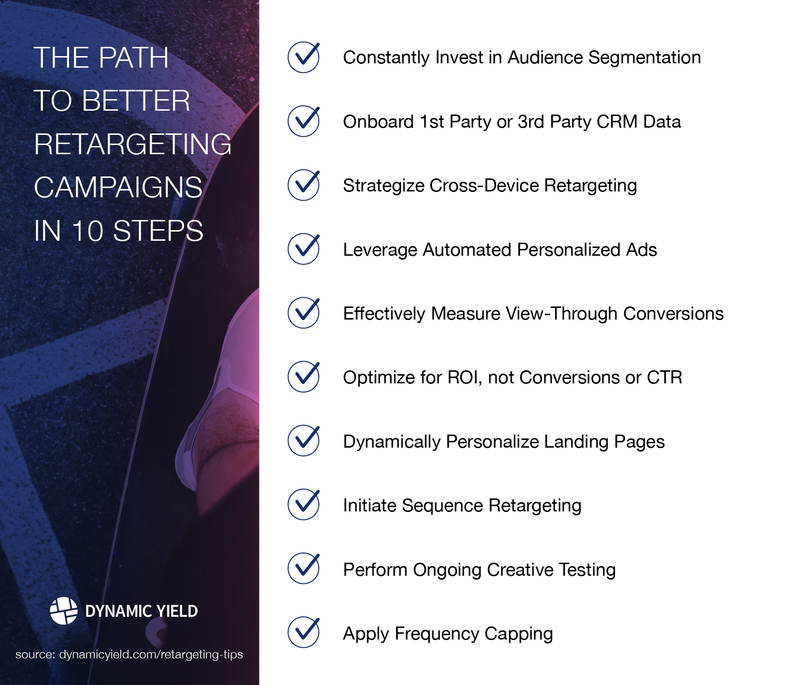 With personalized retargeting campaigns, CTR can be double the percentage of traditional campaigns. Making use of an ad generating platform, that is capable of personalizing and optimizing display ads automatically, will result in greater engagement and better KPIs for your retargeting campaigns. One example for achieving that would be to connect a product feed to your ad building and ad serving platform, in a way that can be used to generate personalized ads automatically, based on past behavior. Impressions themselves rarely trigger a purchase/conversion. However, sometimes the purpose of serving online ads may be to increase brand awareness and build confidence. This process requires marketers to constantly analyze and re-strategize campaigns. View-through conversions move beyond the click-through model, allowing marketers to analyze their dynamic remarketing campaigns more effectively. As an example, view-through conversions are recorded when visitors see your display ads on 3rd party sites without clicking on them, only to return to the site (via any other source) in order to make a conversion. View-through conversion lets you effectively measure the real impact of your retargeting ad impressions over time. This is a more holistic approach that provides insights into the value of your marketing efforts with measurable statistics. Typical remarketing strategies that once focused on optimizing standard click-through rates are gradually being replaced with meaningful and more impactful metrics. While optimizing for CTR may be good for some campaigns, optimizing for revenue can significantly improve others. A buyer’s journey often involves many levels of nurturing throughout the sales process, especially for B2B businesses. The process involves careful measurement of sources of leads that have become sales opportunities and then performing a cost-per-conversion analysis. Evaluating key performance indicators as types of content consumed, campaign costs, ad performance metrics, will allow you to tweak your campaign messages and measure the most effective results over time. While familiarity does breed a sense of comfort, when it comes to a website, static and “one-size-fits-all” content can actually be boring and discourage users. Entice the viewers to land on your site and see something new and different each time they visit. Optimizing for different landing pages gives you an opportunity to convey a different and personalized message. Landing pages that change dynamically may energize your visitors to act and engage with your brand. Some marketers extend this reach down to a granular level with personalized landing pages based on searched keywords. This can be taken as far as personalizing landing pages for geo-location, device, past behavior and even weather forecast. The more personalized the landing pages are, the more engaging they will become. With retargeting campaigns, the delivery of a unified marketing message has already been defined as a “hit or miss”. Therefore, there is a need for a more defined subset to appeal to customers or prospects in a more personal and relevant way. Sequence retargeting is the delivery of a predefined set of ad creatives in a specific order of presentation. They are typically more of a subtle approach that includes branding reinforcement, speaking on pain points, addressing the need that the customer relates to and delivering solutions. Each level offers an opportunity to increase interest and move the viewer into the next area of the purchasing funnel. This sequential approach allows the marketer to also have analytics that can be measured for the success of the campaigns and make the adjustments needed to appeal to those most likely to complete a purchase. Making use of consistent A/B testing requires complete focus on finding the results that work best. Given that consumer interest is in constant flux it, testing requires creativity, spontaneity, and trend awareness as baseline methods to adjust and change marketing messages. Campaigns drill into consumer psychology on a continual basis and marketers need to be prepared to have advanced A/B testing and optimization flexibility. Layering the results involves understanding that the success achieved for one specific group may not work for another, and requires adjusting both the message and approach. That is where contextual A/B testing and predictive algorithms come in handy. Ongoing creative testing seems like an obvious tactic, but in fact – instead of A/B testing single touchpoints, marketers should focus on A/B testing multiple experiences by running segmented A/B tests . Read further about the importance of optimizing whole customer experiences rather than individual touchpoints, in our blog post titled: 3 Tactics for Optimizing Customer Experiences, not Touchpoints. The main focus of every marketer is to attract and maintain the interest of the consumer. However, some marketers overwhelm customers with too many offerings, rendering messages incoherent and useless. Frequency capping is an intelligent method of communicating your brand and acts like an invitation for previewing and acceptance. It limits the number of times that a tagged user will see your ads and prevents the potential customer from feeling ‘stalked’. The capping process allows the potential customer to feel as though they are in control of their buying decisions. In essence, as the internet and consumers evolve, the panorama of marketing will continue to change. Those who will achieve the highest level of success will be the marketers who adopt methods to segregate, align and adapt. Making use of sophisticated dynamic remarketing technology as well as imagination can elevate new challenges and transition them to a renewed sense of awareness through intelligent decision making. Yaniv, if you apply sequencing then why the need for impression capping? Thanks for the question Hashim. Even if you apply sequencing, it would be wise to control the maximum number of times that each individual would see your ad in each sequence wave.